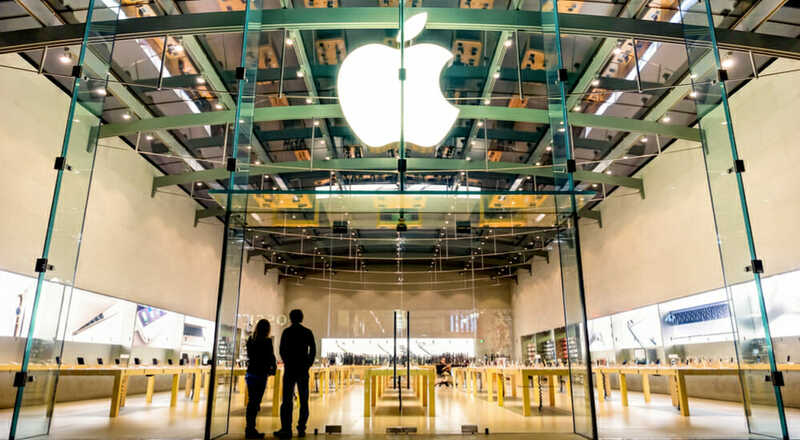 Apple announced they are bringing 1/3rd of a trillion dollars they have acquired overseas back into America. Liberals are either lying about this, don’t even know about it, or are just too stupid to understand it. They are calling it a “windfall” for Apple but recognize nothing about how it will benefit all of America. Business rises and falls on profits. Governments exist by taxing businesses whether they profit or not. If a government takes more than a company makes that company eventually fails. If a government makes regulations that cause the company to lose money it fails. If a government doesn’t have a business to tax then the government fails. This is how Democrats kill the Golden Goose. They think a windfall of income is a company stealing profits it doesn’t expect or deserve. The coined the term in the 70s when the Arabs embargoed oil exports to the U.S. in retaliation against Carter. Carter created the problem, and when oil companies charged more for their product that had become scarce, a typical action when there is less product to sell to a high demand in order not to run out, Democrats punished oil companies by seizing those profits under the term “Windfall Profits Tax.” Democrats never met a tax they didn’t like and have always raised taxes to the point they start killing the engine of industry. Obama fundamentally transformed America into economic stagnation in which the Stock Market only grew because he printed money, i.e. put future taxpayers into debt to put money in the pockets of his rich friends on Wall Street through what they called “Stimulus” and “Quantitative Easing” to “save jobs.” What they did was make the rich richer and the middle class poorer through Obama’s Stealth Depression. When Rush Limbaugh said he hopes Obama fails this is what he was talking about. No one with any good sense wanted a socialist to run America, but the masses were easily fooled and ran obliviously down the road to hell for eight years even re-electing him despite the economic destruction he wrought. Trump’s MAGA undid all of Obama’s oppressive regulations and took Democrat’s boot off of the neck of businesses. The result is an economy that is booming. Now all the media can do is try to put fears into people’s minds claiming that the bubble has grown so fast that it’s going to be a huge burst! But unlike Obama’s phony economic growth, this is real. Democrats have no part of this which is why the media must distract people from what is happening, smear it, and cry racism at Trump. The people who are paying attention to Trump’s unleashing of the American economy, to his constant rebuttal of the liberal media like Road Runner stumping the coyote, to his being constantly and unrightfully slandered are taking note and taking sides against Democrats they thought were for the people. But slandering corporations as killing their customers and stealing from the poor isn’t going to fly their lead balloon anymore. People are getting educated. They are learning that Trickle Down is how economics work. It is not a trick to make the rich richer and the poor poorer. Reaganomics did not add to the deficit. Democrat spending did that even after revenue exceeded pre-tax cut levels. The entire National Debt belongs 100% to Democrats with half of it accumulated just in the last eight years as Obama stole from America’s children. Thank God that Democrats aren’t in charge anymore and that President Trump will not kowtow to their blackmail demands as the Republican establishment has always done. The Stock Market doubled under Obama because he printed money for them and the liberal media praised him for it. 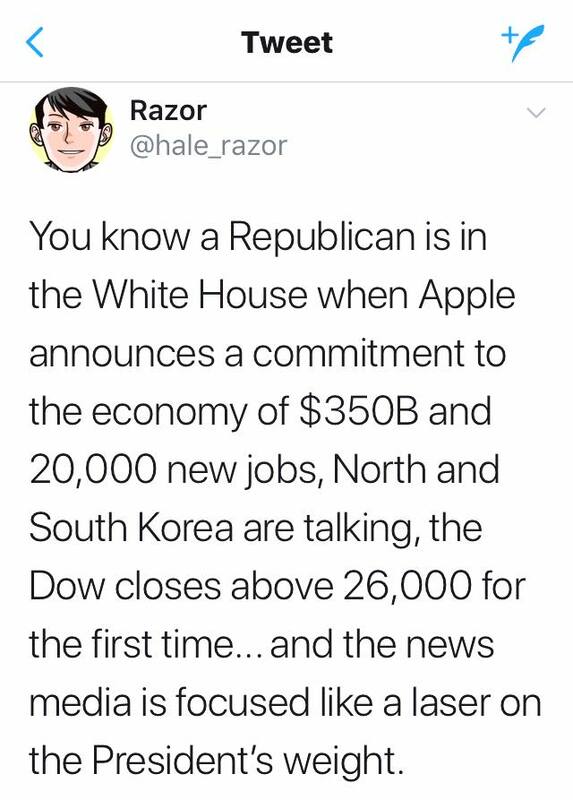 Now it has gone up 50% in just one year under Trump with real economic growth and they curse him for it. Apple is not benefiting from a windfall. How is it a windfall for them? They had all that money overseas they could use as they wish. Now they have to pay taxes on it, but at a much lower rate thanks to Trump. Money that was never going to be part of the American economy or tax revenue now is a major boon and all Americans are the ones who will benefit. Companies are taking their savings from lower taxes and doing what they have always done; giving employees raises and growing their businesses. And Democrats are calling this poop! The only poop involved here is that which is coming out of Democrat’s mouths!